Quick! 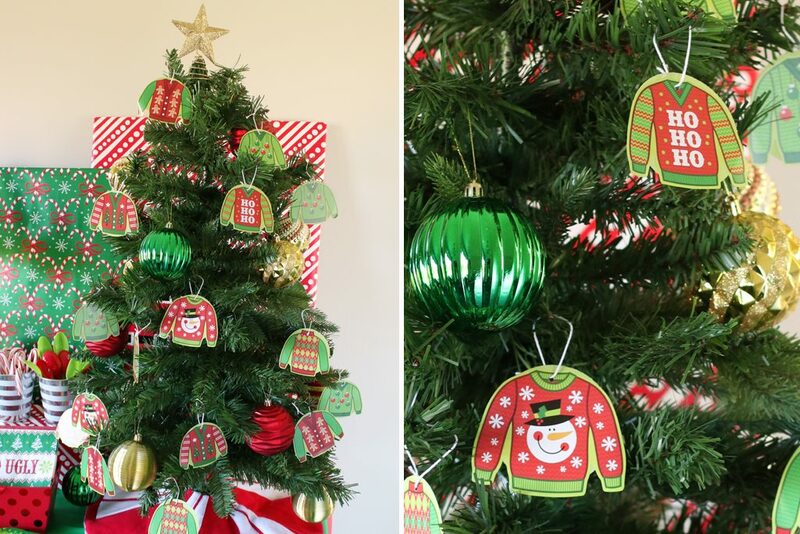 Time to start browsing to find the ugliest christmas sweater you can find! Light up feature? Great! Fuzzy pom poms? Sounds perfect! Stitched designs of cats in Santa hats, horrible color schemes or creepy elves? Even better! 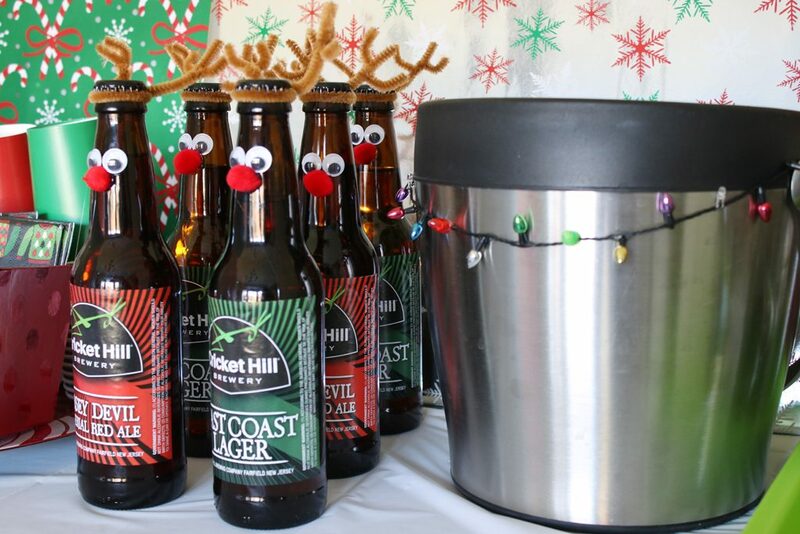 You’ll be all set for the Ugly Sweater party you’re about to throw! 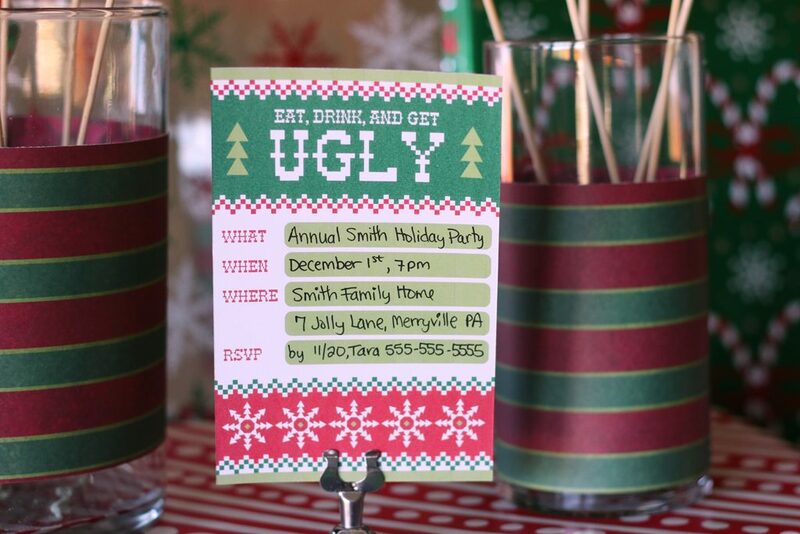 Even though the theme is “UGLY” your party décor doesn’t have to be mismatched. 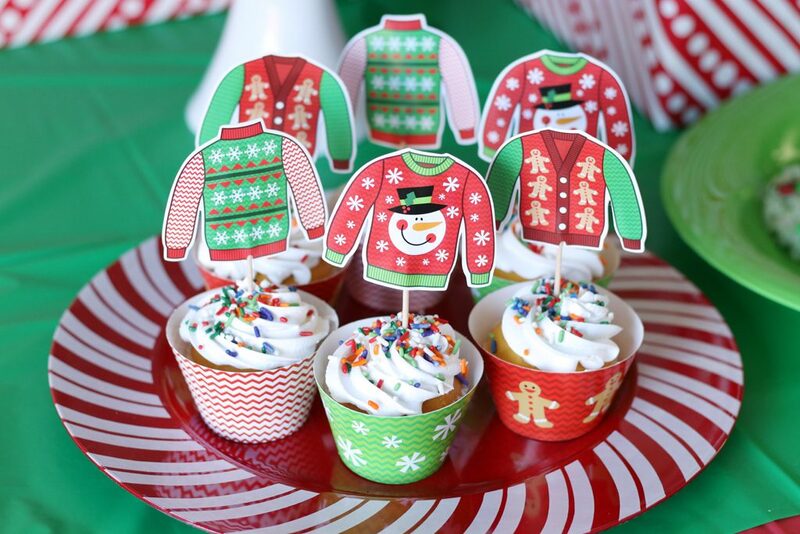 Check out this cute coordinated line of party décor, try out our activities ideas, indulge in our delicious treats and your Ugly Sweater Party will go down in the record books! This post was written, styled and shot by Tara at Spot of Tea Designs. 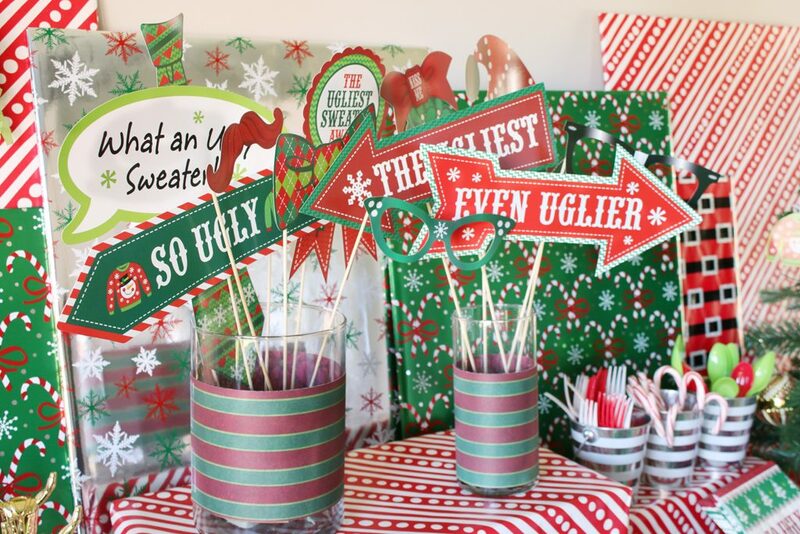 Stop by her blog for more DIY projects, printables and party ideas to add a customized flair to all of your celebrations! Raise your hand if you were running late on ordering custom invitations? If that’s the case, go ahead and download this free Ugly Sweater invitation design and fill it out with a fine point pen or marker! 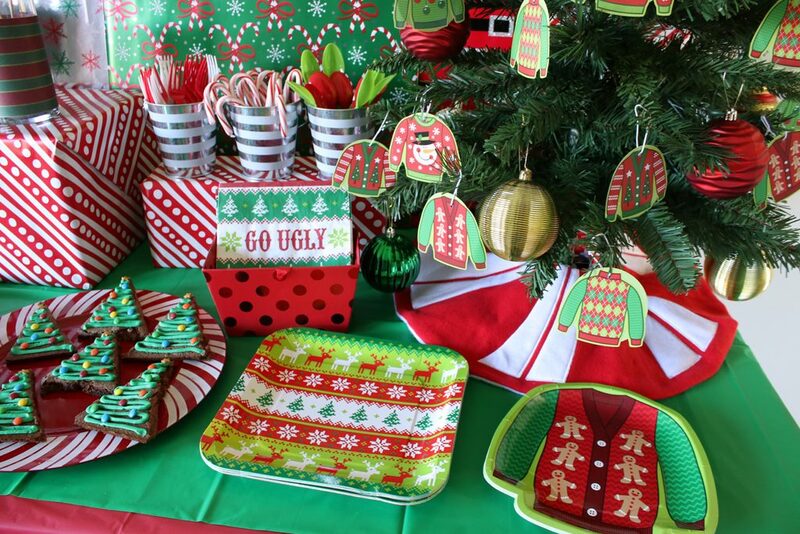 Tip: go the potluck approach at this Ugly Sweater party and use sites like Perfect Potluck to track everything that’s being brought. Slip in a little note about this feature or write it on the back! 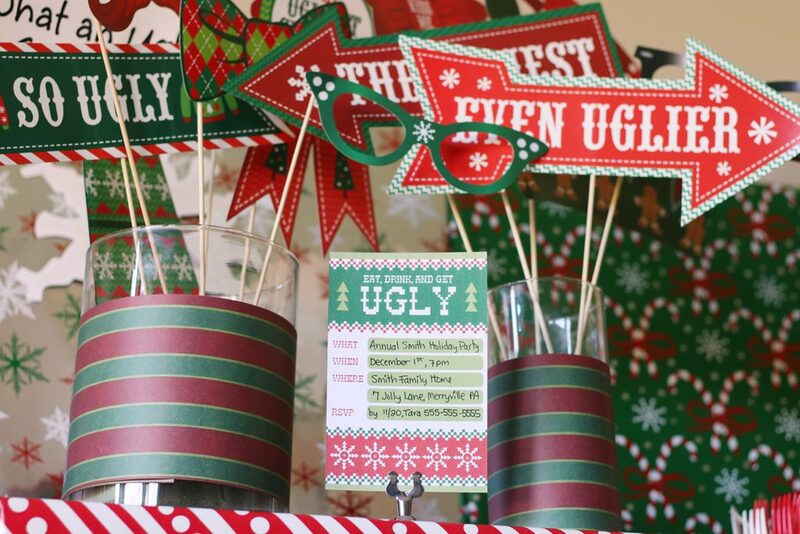 For an easy Christmas backdrop, wrap recycled cardboard in cheap gift wrap then turn them into faux presents with the addition of ribbons, decorative pieces or tassels to complete the look. 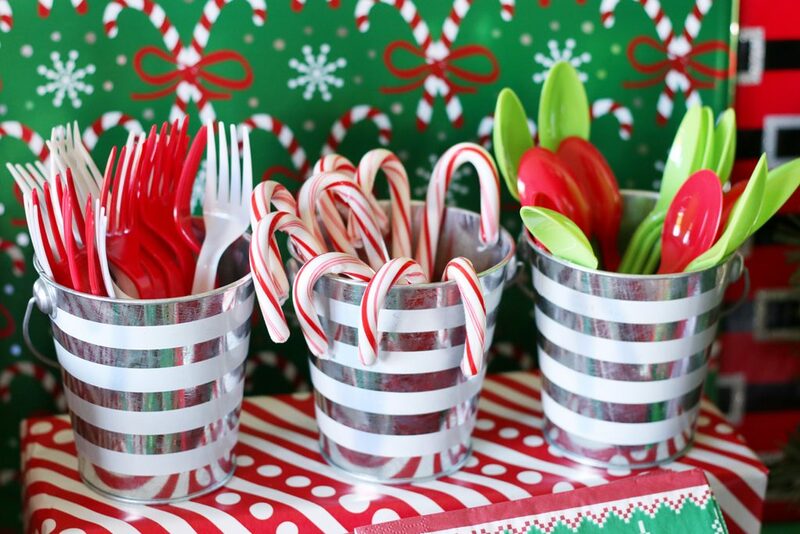 Create additional layers to display all the cutlery by wrapping empty boxes like more presents! 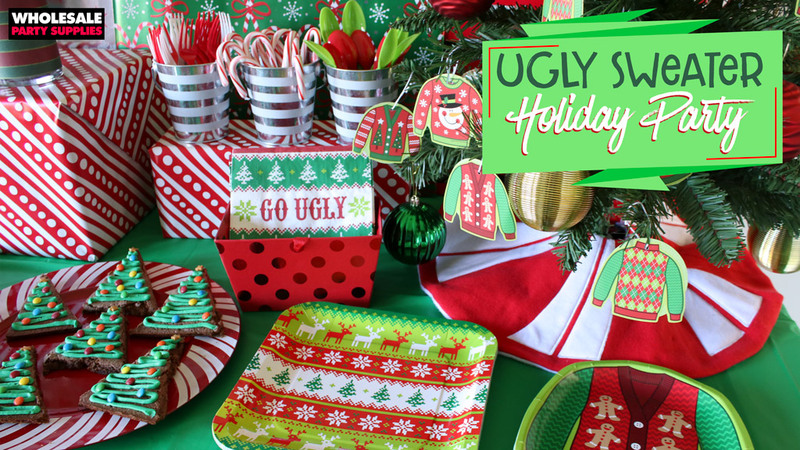 Spread the coordinating tableware right in front for easy reach to grab all the holiday-themed goodies. Tip: keep napkins in a box or container so they don’t spill over but are easy to grab when their hands are sticky with a sweet treat. Break out your mini Christmas tree and use it in your table display. Want matching ornaments? 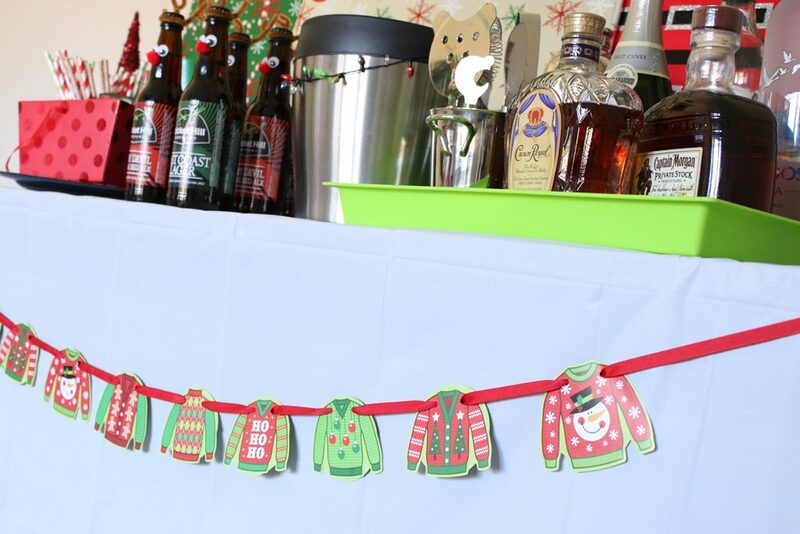 Create your own using Ugly Sweater Stickers, cardstock and string. 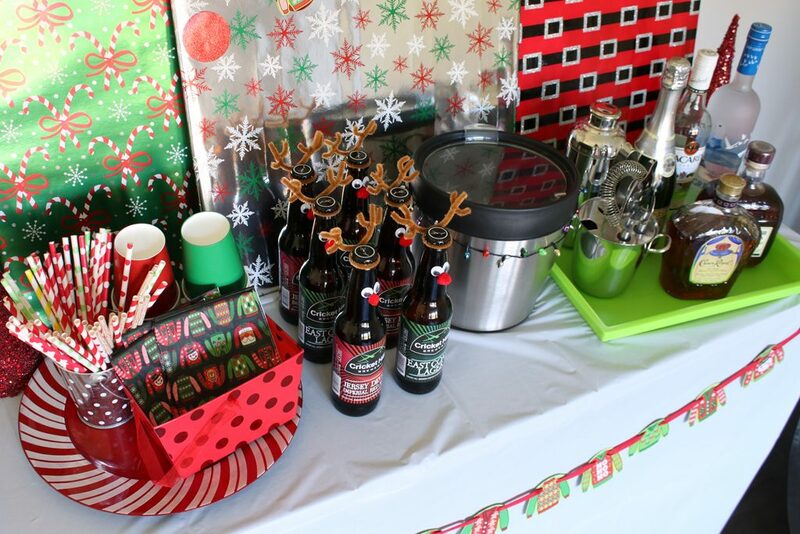 Use those same stickers as garland over at your bar table area. 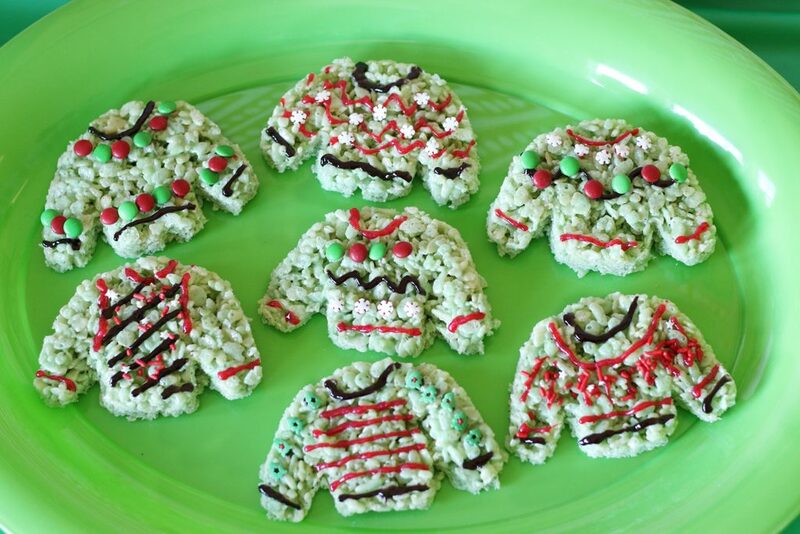 Break out the sweater cookie cutter and get to work making Ugly Sweater Rice Krispies Treats or Sugar Cookies, then decorate with icing, sprinkles and candies. 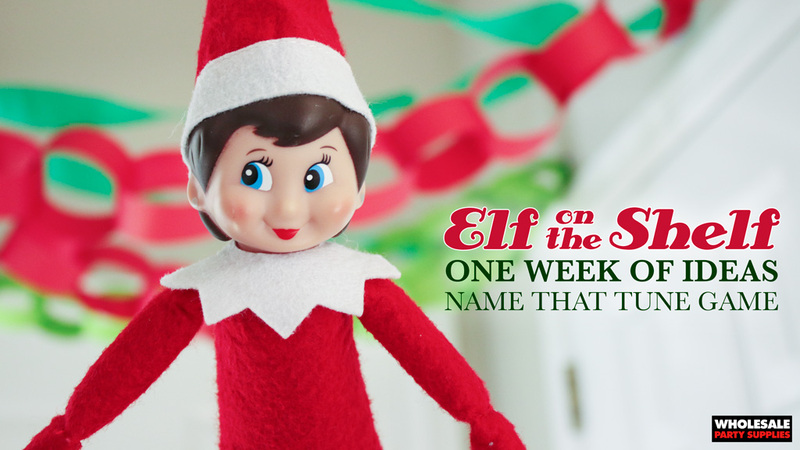 Tip: this could also be a fun activity to make as a decorating station! Turn a boring sheet cake into a delicious ugly sweater! 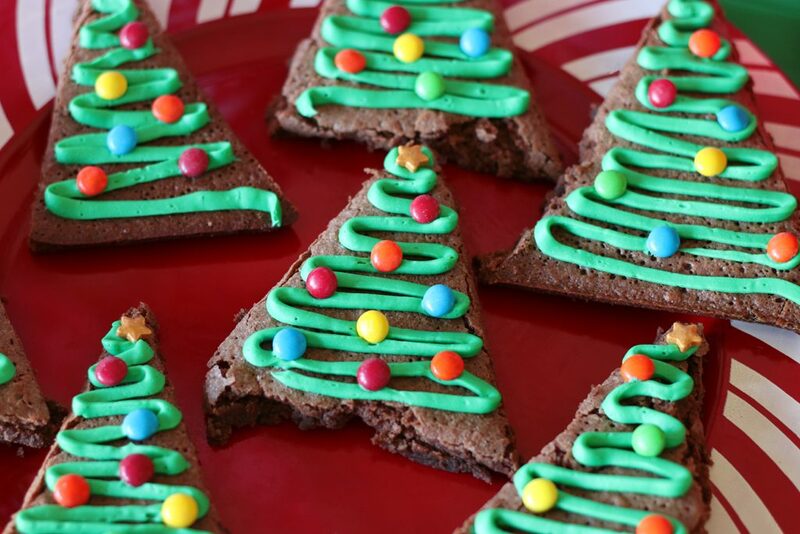 Add some icing to brownies cut into triangles and you instantly have some fudgy trees! Tip: use a plastic zip bag easily pipe these lines onto the brownies without having to invest in a piping bag. Use free printables to make snowman doughnut stacks! Mashup OREO cookies to make cookie balls that look like Christmas ornaments! Don’t forget the booze! 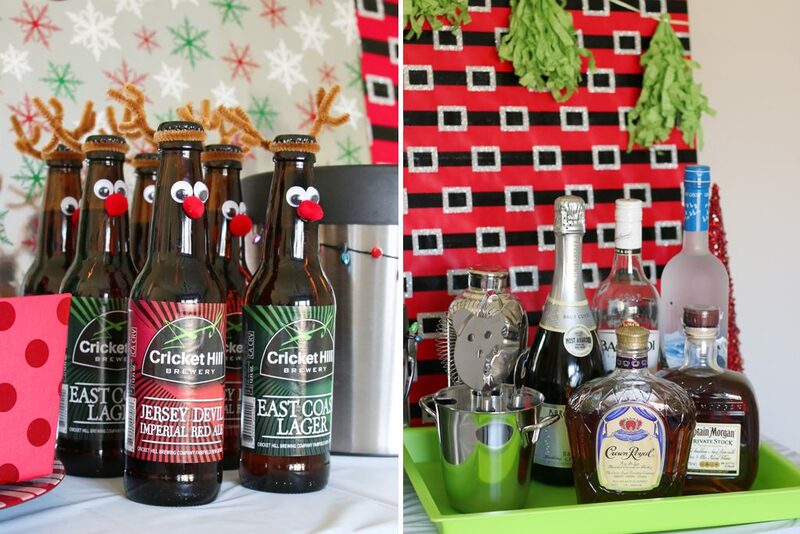 Use all your skills and party supplies to dress up a bar filled with adult only drinks! Make reinbeers! Alcoholic or not, your favorite bottled beverage can be in costume at this party with the help of some pipe cleaners, pom poms and googly eyes! Bonus points for choosing beer labels that are green and red! String on a Christmas light necklace and dress up your ice bucket! Corral supplies, like stiped paper straws, on a tray to keep it from spilling over. 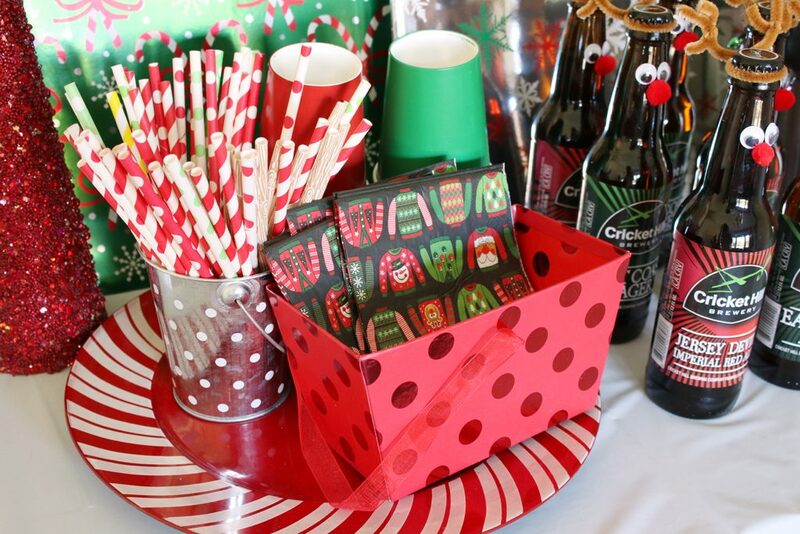 Decorate plain drink cozies with puffy paint and pom poms to cozy up against your canned drinks. 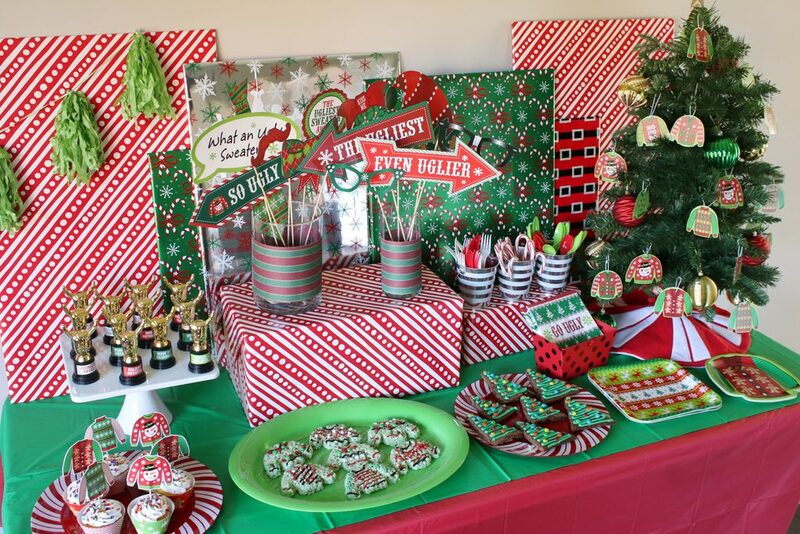 Save costs on all printed party décor and use solids and basic prints to keep the theme going. 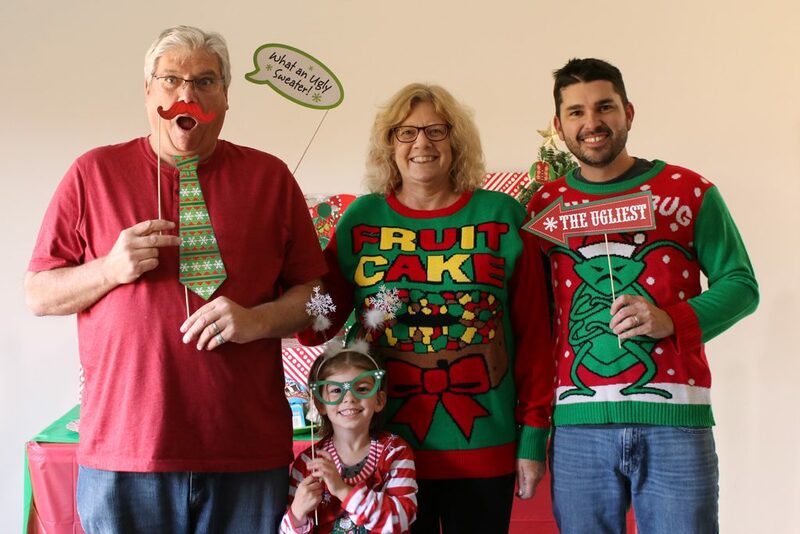 Your friends either took the time to hunt down the ugliest sweater in their local thrift shop or DIY’ed their own ugly creation so spend some time giving them props for their determination to fit your party theme. 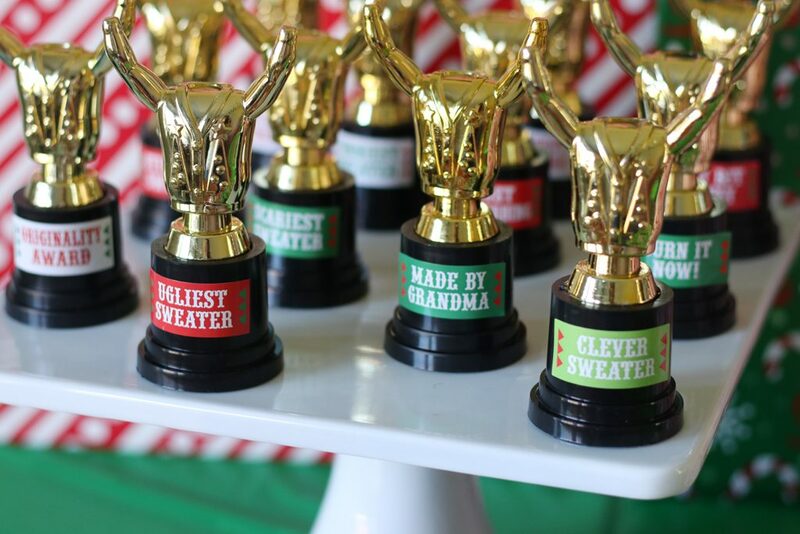 Host a little ugly sweater contest and award the winners with award sessions to wear or mini trophies to add to their desk at the office. In case some party poopers were being all bah humbug, make sure to throw in a few extra accessories like these ugly sweater headbands or snowflake styled ones to get into the party spirit. 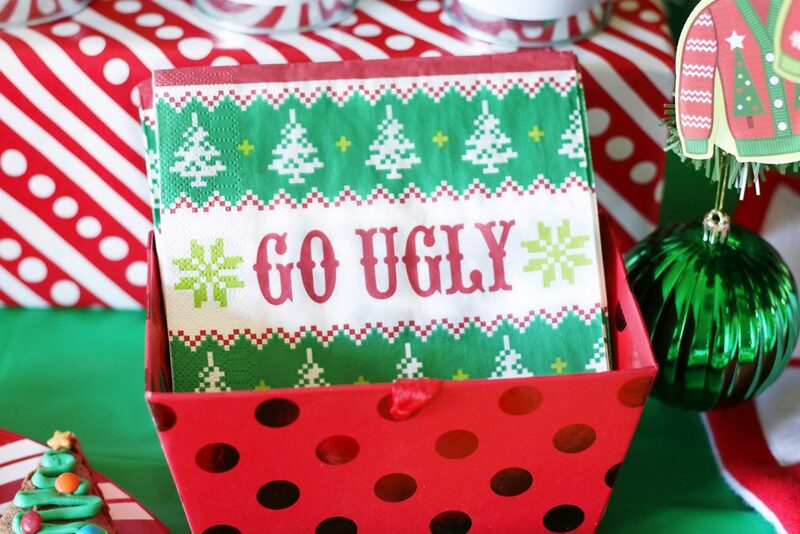 An Ugly Sweater Party is one that definitely needs a photo booth to capture all the beautiful…er…ugly creations everyone is sporting. Tip: Insert photo props in tall glass vases and let them double as a table decoration before being used to strike a pose. Cute cookies and candy treats are great but when it comes to adult parties, wish everyone a bit of good luck with lottery tickets! 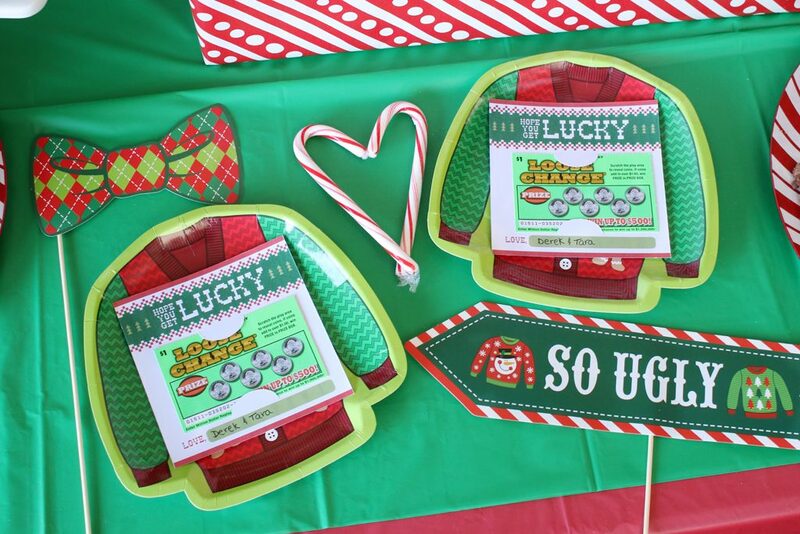 Print these Ugly Sweater Lottery Ticket Favor cards and slide a (hopefully) lucky ticket inside. 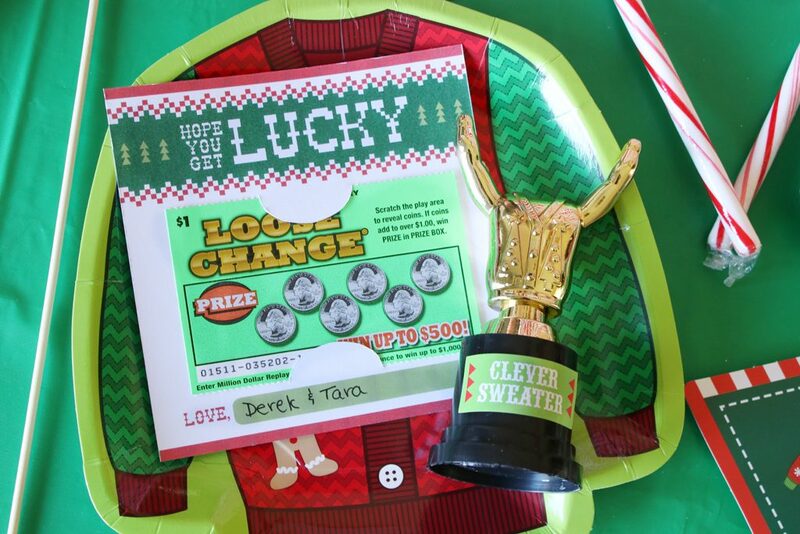 Wouldn’t that be a story to tell – someone winning the lottery thanks to your awesome Ugly Sweater party?